The firsts keep on coming for Felix Auger-Aliassime in 2019. On Sunday, the #NextGenATP Canadian was a man on a mission in securing his first Round of 16 berth at an ATP Masters 1000 event. Auger-Aliassime fought past Hubert Hurkacz 7-6(5), 6-4 in one hour and 42 minutes at the Miami Open presented by Itau. The Montreal native was an elastic wall from the back of the court, using his great flexibility and dynamic shotmaking to put Hurkacz on his heels. The energy was palpable on Court 1, as a fist-pumping Auger-Aliassime fired 34 winners in total, including 10 on his backhand wing. Auger-Aliassime barely put a foot wrong, and even when he did, he still won the point. With Hurkacz serving to stay in the match at 4-5 in the second set, the Canadian came out of his shoe mid-rally. And he still had the composure to toss it towards the back wall and force his distracted opponent to net the ensuing forehand. Three points later, Auger-Aliassime was celebrating a spot in the Round of 16 at Hard Rock Stadium. “Hubert is playing really good,” said Auger-Aliassime. “From both sides it was a great match. No breaks of serve until the very end. He’s doing a lot of good things and I have a lot of respect for him. 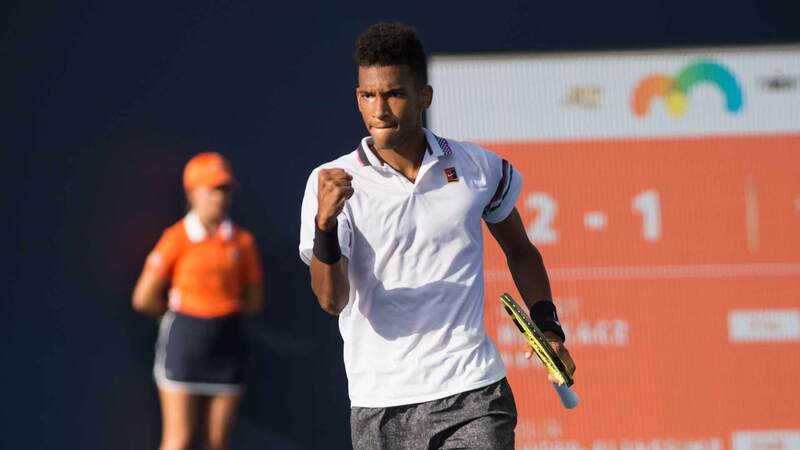 One year after falling in a deciding tie-break in the first round of qualifying, Auger-Aliassime finds himself in the midst of a breakthrough Miami campaign. He has claimed five wins in seven days as a qualifier, including a comeback victory over Casper Ruud and another three-set win over Marton Fucsovics on Friday. In addition, his win over Hurkacz is his 12th on the ATP Tour this year, already doubling his 2018 total. The 18-year-old is making his presence known on the ATP Tour in 2019. One month after reaching his first tour-level final in Rio de Janeiro, he is in the midst of a strong run on the ATP Masters 1000 stage. He scored his first Top 10 victory over Stefanos Tsitsipas earlier this month in Indian Wells and is turning heads this fortnight in Miami. Auger-Aliassime will next face Nikoloz Basilashvili for a spot in the quarter-finals. The hard-hitting Basilashvili blasted past Robin Haase 7-6(3), 6-3 on Court 1, firing 14 aces and claiming 27 of 42 points over five shots. “I am very happy for sure,” said Basilashvili. “These courts and balls are different from Indian Wells so it takes time to get used to the conditions. I don’t know why, but I always struggle in Indian Wells and Miami and I need to feel the court and atmosphere to play my best tennis. The Georgian suffered a first-round hiccup against Prajnesh Gunneswaran in Indian Wells, but has righted the ship thus far in Miami. Straight-set wins over Mischa Zverev and Haase has him into the Round of 16 of an ATP Masters 1000 event for the second time (Cincinnati 2017).